Designed with the user in mind, EASYLABEL was derived from a comprehensive list of requests and suggestions from our customers. The idea was to take the stability, reliability and functionality of the current EASYLABEL products and implement a new, sleek and intuitive design to give EASYLABEL a more Windows-like appearance. Basically, if you are familiar with today’s office applications, then you will feel very comfortable with EASYLABEL. Simply stated, EASYLABEL is easier. Unlike the “bargain” packages, EASYLABEL includes every conceivable method of making label design easy, fast and accurate. You don’t have to be computer literate to fulfill complex labeling requirements. The goal of EASYLABEL is to make you productive, successful, and more effective. Basically, it does all the hard work for you, so you don’t have to. 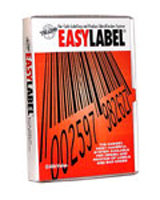 With the shortest learning curve in the industry., you’ll be making labels faster with EASYLABEL than with any other labeling software package available. Please contact us to inquire about versions of EASYLABEL that are not listed on this page.